Everyone goes to school to get a good job. Right? In this Rich Dad Scams video, Robert and the Rich Dad Team debunk the myth that getting a job is good… Confused? Then you might have been Scammed. Watch this Rich Dad Scams video to learn how. 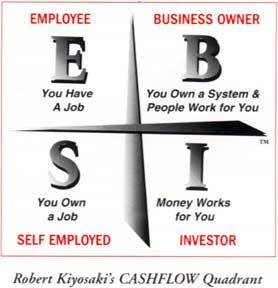 At the time of this writing, I have a toe in all 4 quadrants, though working on moving “full time” over to the right side by the end of this year. Where are you at and what are your plans? I’m always looking for great opportunities, so, if you have one, please share it with me.